Does your family tree ever weigh you down? Here's an easy way to push ahead without getting burned out. I've been off to the races on my 2019 Genealogy Goals. I completed my 1st goal by mid-January. Now I'm making a serious push on my 2nd goal. but the 2nd one can get tedious. 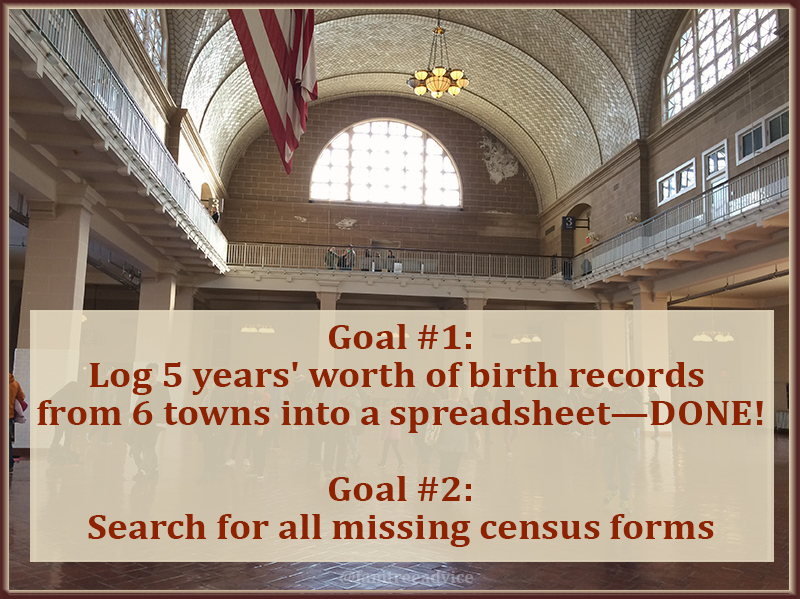 I'm excited about how many census forms I've added to my family tree in a short time. Fifty-five in 2 weeks! But sometimes I get bored. I'll find a census for a big family and think, "Now I've got to add all these facts to all these people." I don't want to stop working on my tree. But it can feel like a grind sometimes. What's a bored genealogist to do? I've been using an anti-boredom strategy since I was a girl. I still use it when I'm cleaning the house, shoveling snow, or working at my day job. The secret is this: Jump from small task to small task and trick your brain into thinking you're on to something new. For example, when I mow the lawn, I tend to shift directions. Carve out a smaller section to cut. I'm purposely not committing myself to an enormous job. I'm committing to one piece of the job at a time. I'm telling myself I can stop whenever I want to. Then I realize I want to do another section. I go on to complete the larger task, one piece at a time. Why not apply this strategy to genealogy? I still encourage you to keep a list of genealogy goals—even if you won't complete them this year. But, to battle any boredom, keep a separate, smaller task list. These tasks are the things you can jump to when your bigger goal is bogging you down. Last night I was getting discouraged with one family because I couldn't find them in 1910 or 1930. I tried all kinds of search tricks, but they kept hiding from me. That's when I noticed a problem with some of the images in my family tree. They were missing a date or category, or weren't named in my usual style. I'd detached a few unwanted images, but I'd forgotten to delete them. I overcame my boredom and frustration by fixing the problems with these 30-something images. It was a mental break. A short, easy task. And I'm so happy they're fixed. I pressed on and edited the captions for all my photos of grave markers. I wanted them to be consistent, and I could never decide if they were tombstones, gravestones, headstones, or what. 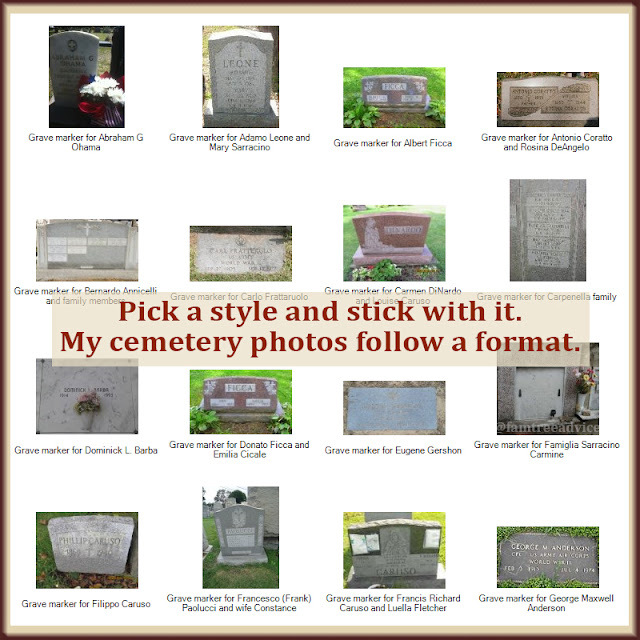 So I chose "grave marker" and labelled each photo in the same way. I put the cemetery name in the description. If I had the original URL for the image, I made sure each one said "From the Find-a-Grave website" followed by the URL. Cleaning up a certain file type in my family tree was a quick break to get me back on track. You must have similar tasks you'd like to complete. Start your list of boredom busters. Choose one as a mental break when you feel frustrated by a brick wall. Don't avoid genealogy because one family is driving you crazy. Move on to something simpler for a while. Something you can finish with no obstacles. Break through that boredom while making your end-product better and better. Your family tree is going to be the tidiest family tree in the neighborhood! Show you how good your genealogy skills are? Help you connect with a new friend? Teach you some new research tricks? The other day a woman reached out to me longing to know about her lost Italian roots. Her grandfather Matthew had given up his Italian name to blend into American society. After Matthew and his wife divorced, their children had very little contact with either of their parents. The woman who wrote to me loved her grandfather, but knew nothing about his origins. She offered me the few clues she had, and asked if I could help. When an assignment comes my way in life or at work, I like to take a peek at it and figure out how hard or easy it might be. Many times this quick peek hooks me. I'm interested, and I'm making progress. So I dive in and get to work. That's exactly how I began this challenge. Mattio d'Arcangelo was born in 1900 to Valentino and "Ginny"
His children, Eleanor and Robert, were given Mattio's adopted last name of Matthew. I wasn't getting anywhere searching Ancestry.com for Mattio. I switched to searching for his father, Valentino. I thought his distinctive name would make him easier to find. 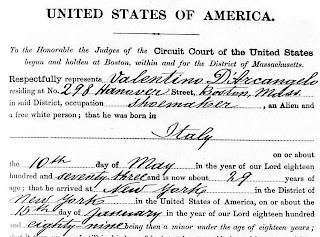 Right away I found naturalization records for Valentino d'Arcangelo. I scoured the information, but I had no proof yet that this was the father of Mattio. His naturalization papers did not mention any family members. But they did include his exact birth date. Giovannina d'Arcangelo, age 25, from Italy, daughter of Raffaele d'Arcangelo and Felice Subrizio. There was a good chance Giovannina is the real name of Mattio's mother "Ginny". But I needed more proof. This 1910 census provides 2 great aunts and a great uncle. I found the 1910 census for Haverhill, and there they were. A family of 6: Valentino and Giovannina (now called Jenny or Jinny), and their children Mattio, Assunta, Pastiano and Mary. Mattio was born in Massachusetts, but his younger sister was born in Italy. The census taker crossed out Massachusetts for Assunta, and wrote in Italy. A 1902 ship manifest supports the idea of the family returning to Italy for a while. 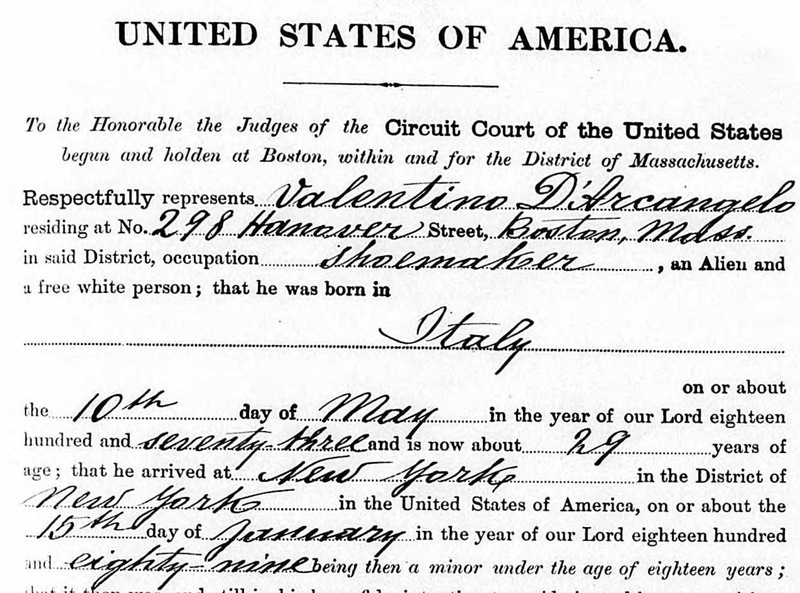 In November 1902 Valentino is returning to America—to Haverhill—without his family. Giovannina and her first 2 children must have returned at a later date. I found out from the manifest that Valentino was from the town of Bisegna in the province of L'Aquila. 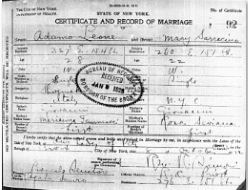 Unfortunately, there are no birth records available online for Bisegna after 1866. I went on to find Valentino as a widower in the 1920 census. A death index shows he died in 1942. I wanted some more documentation for Mattio—my new friend's grandfather. I saw that his memorial on Find-a-Grave has his name as Matthew F. Matthews. When I couldn't find him in the 1930 census, I looked for his wife Evangeline, and his kids Eleanor and Robert. Mattio d'Arcangelo, aka Francis Matthews. I found them living in Needham, Massachusetts, but the head-of-household was Francis Matthews. That memorial with the middle initial F. turned out to be a good clue. I'd discovered quite a bit in one sitting. Mattio's granddaughter was just about in tears. Join any genealogy group on Facebook. Every day people ask for help. They may list some of their ancestors' names and dates and ask how to find out more about these people. Got DNA? You may belong to websites that suggest DNA matches to you. I read about an avid genealogist who is researching and building trees for all his DNA matches so he can figure out their connection. Maybe you have a friend who's mildly interested in your genealogy hobby. Help get them hooked by starting their tree for them. Ask for some basics about their parents and grandparents: names, dates and places. Use the clues, your genealogy resources and skills and see how much you can find. Be careful not to make assumptions. Let the facts point you in the right direction. Document everything you find clearly and thoroughly. List the facts in chronological order and show where each fact came from. Provide this person with the facts and the documents you've found. Imagine that you are a professional genealogist, and do the best work you possibly can. Once you've tackled this challenge, you may want to take a fresh look at your family's brick walls! Why not share your photos on Find-a-Grave? But what if the genealogy research you're doing for yourself can help people you don't even know? Wouldn't it thrill you if someone else shared research work that's invaluable to you? Last month I took a deeply satisfying genealogy vacation to Italy. I visited each of my 4 ancestral towns in the province of Benevento. I visited each town's cemetery and took lots of photos. I concentrated on last names that meant something to me, but then I'd find 30 graves with that last name. Now I'm going to share those photos on the Find-a-Grave website. First I clicked the Cemetery tab on the website to browse for cemeteries in Italy. There were no listings for my 4 cemeteries, so I'm creating them. To prepare for my vacation, I saved the longitude and latitude of each cemetery in Google Maps. Now I can use those numbers to precisely locate my 4 cemeteries on the Find-a-Grave map. I took a photo of the cemetery entrance just so I could add it to Find-a-Grave.com. Once I create the new cemetery, I can upload a photo of its entrance. You see, before my trip I read someone's tip to be sure to take a photo of the cemetery entrance. So I did. 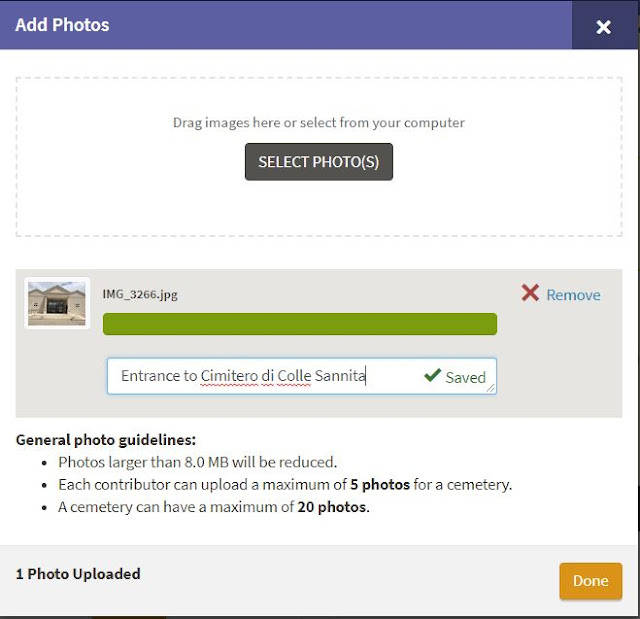 Next, I can drag and drop all my photos from that cemetery at once. After dropping the photos, I simply go down the list adding the deceased's name as the caption. 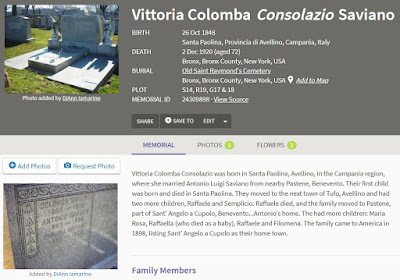 If you know the person whose grave you're uploading, it's nice to add a memorial. A while back I added a photo of my great great grandmother's grave in the Bronx, New York. I also wrote a paragraph outlining what I knew about her. Today my research on her family has gone much further, so I updated my memorial. I have so many photos to upload, and then I will detail each one with the dates I see on the grave. Someday, I hope relatives of the deceased will contact me. Maybe we'll be cousins! What can you do to preserve your family history and, at the same time, pay it forward? In high school my son had an assignment to create a document of his family tree. He laughed and said, "Mom, print that out for me?" That's as far as many people get: parents, grandparents, and a portion of their great grandparents. But for those of us who keeping researching and researching, genealogy is a project that is never finished. And we don't mind at all. Here are some free resources that won't "finish" your family tree, but they can make it stronger, broader, and more satisfying for you. Spanning the years 1820 through 1891, this free online collection can be searched or browsed by microfilm roll number, each roll spanning months. Another collection includes the years 1909 and 1925 through 1957. Search by name for SSDI records between 1962 and 2014. The results show the person's age, full name, birth and death dates, the state in which they died, and their last place of residence. England and Wales censuses are available online from 1841 through 1911. Check out the full list of England resources on that page. You'll be impressed. 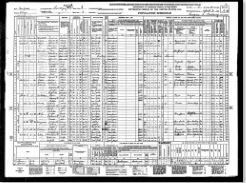 The Canada census is available online from 1851 through 1911 with a bonus year of 1906. Have you considered trying Find a Grave for cemeteries worldwide? When you view their search form take a look at the pull-down menu next to "Cemetery in" and you may be surprised by the number of countries included. While the non-U.S. listings are slim, they are growing. If it helps you to have some paperwork to carry with you on your research travels, these genealogy forms and charts will be very useful. 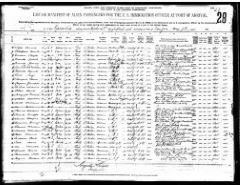 Print out ancestor charts, research logs, census forms, family record sheets, and more. Everyone likes a bargain, and it is certainly worth your time to see what resources are out there that you haven't tapped into yet. I've made it clear in my welcome message that I never trust someone else's family tree if they don't show their sources and I can't reproduce their facts. So even if I'm given facts by someone I trust, I will still do my due diligence and search for factual proof. A good resource to use when you don't have access to someone's birth or death record is the Find A Grave website. If you're lucky, you may get to see an image of the headstone with full birth and death dates. 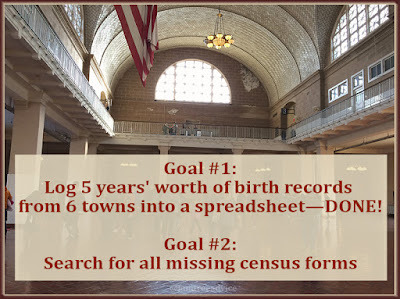 A genealogist's giddy dream! Here's an example of a situation where I wanted to verify the birth and death dates I'd been given for one relative, but you can also try this not when you're trying to prove someone else's work, but when you're trying to fill in missing dates. I knew from census records that this man lived in Cleveland, Ohio and was alive in 1940. 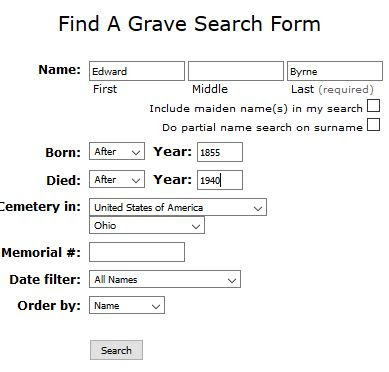 So I used the search form in Find A Grave to find an Edward Byrne who was born after 1855 and died after 1940 in Cleveland. 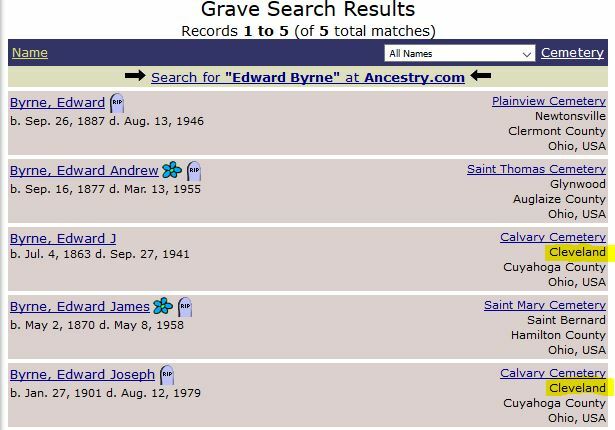 The search yielded five Edward Byrnes, but as my yellow highlighting shows, only two are buried in Cleveland. Focusing on those two, I see one was born in 1863 and died in 1941—that fits. The other, as it happens, is the son of the man I'm looking for. When I click his name, I am not given an image of his headstone, but there are several facts recorded by someone I do not know. Once again, it's up to me to determine how many of these facts are trustworthy. But there is truly an abundance of facts, and I'm grateful for that. I know from the census forms I've collected that he was a grocer. That fits. I know his street address in 1940. That fits. I have the names of many of his relatives, and I see them listed here. Short of seeing his birth and death certificates myself, this looks like credible data. And based on this information, I could attempt to purchase a copy of either his birth or death record from the state of Ohio. Remember, the more resources you use to corroborate the facts about someone in your tree, the stronger your tree will be.